Dr. Spence Misner, an Illinois State alum, describes the next stages of treatment to Bobby Rice at the clinic in Dalton, Georgia. Bobby Rice never expected that cutting his foot could reshape his entire life. The Dalton, Georgia, carpet layer was walking trash to the dumpster outside his apartment when he stepped on broken glass. Rice felt no pain and because of his profession, was used to dealing with scratches and cuts. He bandaged his foot and didn’t think any more of it. At least he tried not to. But the glass had created a hole in his foot that constantly drained, ruining his socks. Rice was still not in any pain, so he decided to use a remedy that he had success with many times before. He superglued the wound shut. The draining ceased, but the real problems were just beginning, as the wound quickly became infected. The infection began traveling up through Rice’s foot, ankle, and eventually lower leg. His leg began to swell and change color from shades of blue and green to patches of black. Yet it was still easy for Rice to ignore since he wasn’t in any pain. Eventually fevers of 104 degrees, nausea, and shaky limbs accompanied Rice’s discolored flesh. His nausea was so severe that he went more than 21 days holding down nothing except Sprite. Finally, after blacking out on the floor in his apartment, Rice knew that something was very wrong. He called a cab and was taken to the hospital. Doctors examined Rice and quickly identified the problem. Rice’s leg had become infected with necrotizing fasciitis, more commonly known as flesh-eating bacteria. An undiagnosed diabetic, Rice also suffered from diabetic neuropathy, which had destroyed the nerves in his legs and explained why he couldn’t feel what should have been a painful injury. Treatment of Bobby Rice’s foot was completed every three weeks for more than six months. Rice, right, is seen here with Dr. Spence Misner. The decision for the physician examining Rice’s leg was clear: amputate. Given the severity of Rice’s situation, Dr. Spence Misner ’73 was called in. 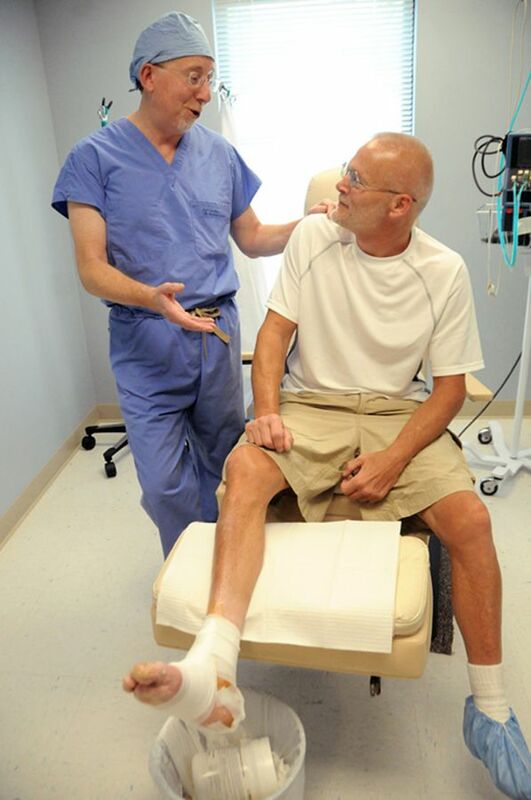 Misner, who had been practicing foot and ankle pathology for more than 30 years, specialized in limb salvage, treating high-risk patients with critical wounds on the verge of losing a leg. If Rice was hoping for a different answer from Misner, he would be disappointed. Misner initially came to the same conclusion as other physicians. Rice would lose his leg. Misner knew that in taking Rice’s leg, he would also be taking his livelihood. The doctor brought Rice into surgery twice, each time cutting away more infected flesh. By the time he finished, barely anything aside from tendon, bone, and an open wound remained from 6 inches above Rice’s ankle to his toes. Weeks of advanced wound care yielded little progress. Despite Misner’s skill, the situation was beginning to look hopeless. Fortunately, Misner had a breakthrough. One of the sales representatives that he was acquainted with mentioned a company he worked with, Osiris Therapeutics, that developed several stem cell products. Misner called the company and explained Rice’s situation. Osiris agreed to donate anything that Misner needed, however, a stem cell tissue transplant on this level had not been attempted. Rice agreed to give it a try. With Misner agreeing to donate his time, and Osiris agreeing to donate nonembryonic stem cell products Grafix and Ovation, Misner prepared to begin the treatment. When the first of the stem cell products arrived, Misner took them to the -75 Fahrenheit cold storage at the hospital, where he opened the container to inspect what he would be working with. What Misner found were 2×2 tissue squares half the thickness of Saran wrap that contained stem cells, connective tissue, growth factors, and skin growing cells. What he didn’t find were recommended procedures for administering the stem cell treatment. The tissue transplant was a slow, tedious process. The squares, which thawed slowly, were peeled off of their backing and placed directly on what was left of Rice’s leg using microscopic forceps. “It sounds simple, but it can be a difficult substance to work with,” Misner said. “It is similar to Saran wrap in that it balls up. But it is 10 times harder to work with because you can’t throw it away since each square is expensive.” Each is valued at approximately $2,000. Covering a wound as large as Rice’s required 10 or more squares. With the treatment being repeated every three weeks for more than six months, the cost for the stem cell products alone quickly rose above $250,000, making the products donated by Osiris a significant investment—especially when considering that the case was unprecedented and Rice lacked health insurance. The investment Misner and Osiris made in Rice’s foot slowly began to yield results. Between December 2011 and May 2012 the stem cells regenerated tendon, ligament, fat, bone, and skin. An additional surprise came during a later treatment session when a nurse tickled Rice’s foot. Rice jerked his foot slightly and exclaimed that it tickled. The words passed without notice, until Rice realized the significance of the moment. Feeling had returned to his leg. The stem cells were regenerating his long-damaged nerves. In time, after more than 10 treatment sessions over six months, Rice’s leg was almost completely healed. Rice is also pleased with the outcome of the treatment. Moving forward, Misner will be sharing his findings with the medical community. He has already received requests worldwide for findings on his procedure, as well as several requests from patients with similar precarious conditions. Misner is eager to see the work continue, but knows it will take more than him to find the future of stem cells in limb salvage. Photos: See how Misner transformed Rice’s foot from a limb riddled with gangrene and flesh-eating bacteria to a new, healthy appendage. WARNING: The gallery contains graphic images that may be unsettling to some viewers.